Situated only 8km from Marrakech Menara International Airport, and 10km from Mararkech itself, Assoufid Golf Club provides a top quality desert layout which will be sure to test golfers of all standards. Winner of Morocco’s Best Golf Course 2016 & Africa’s Best Golf Course 2016 at the World Golf Awards. We found 36 offers matching your search. 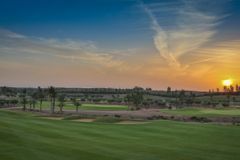 With the spectacular backdrop of the Atlas mountains, this brand new Niall Cameron designed 18 hole golf course is the newest edition to Marrakech's portfolio of outstanding golf courses. Surrounded by desert the courses subtle sloping fairways, various elevation changes and well guarded greens make for an interesting but fair test for golfers of all standards. A great pity that French golfers can't be bothered to rake bunkers. Particularly noticeable on this Moroccan course, given we have played it three years running now. Bunker etiquette by visitors needs to improve, or green staff need to be deployed to rake bunkers during busy times! Signage between holes needs to be improved. Enjoyed the coursed but there was a lot of rocky areas to carry from tee boxes and off the fairways which meant placing the ball on to grass area otherwise there was the risk of ruining ones clubs. The most pleasing course to the eye, of the 3 we played. Not just a flat desert course with tough greens. The course is undulating with hidden hazards. The director of golf took the time to chat with us and other groups on the terrace, recommending other courses and places to see, which was a good touch. The most attractive of the three courses we played. Really enjoyed this course. Greens and fairways were the best quality of all the courses we played in Marrakech and the holes were interesting with plenty of doglegs and hidden bunkers. We enjoyed the game. The staff were courteous and helpful. I do think that there could have been a bit more information about the facilities and the course from the pro. shop. Overall experience was good. This report broadly is the same for our overall holiday experience on the courses booked by YGT. We may have been unlucky but the course was blocked up by a large group of French, who appeared to be playing a tournament moving from one course to another and we in tow! We witnessed 8, 6 and 5 people in the groups ahead moving very slowly ignoring normal golf etiquette. The course encouraged caddies and the group in front used their caddy as a teacher, naturally slowing things up. We reported our feelings and the Manager (a scot) took our concerns on board, and said he needed to brief the marshalls more firmly. For a lady that doesn’t have a big hit the carry over the dirt/shale area on some holes is vast. Mainly on the front 9 so this course does need course management. Can’t fault the greens,views and the club house facilities. The Atlas Mountains in the background is stunning. Friendly personnel, great facilities, stunning views. Would definitely play it again. Beautiful course and I dont usually write reviews.. Definitely in the top 5 for Marrakech..Pristine condition and overall worth every penny! A tricky desert course with a few challenging holes. We played the front nine at average speed but the back nine was very slow with four groups waiting on a par 3. The best of the four courses. Did not like the long carries off the tees and the mud traps. The 17th was the most memorable hole all week. Another excellent course which will also mature into a very good test of golf. Fairways could have been cut a bit shorter but obviously they are still relatively new. Facilities very good. Not difficult to understand why Assoufid has recently been voted top course in Africa. Course was again in superb condition with some holes demanding some thought rather than hit & hope. Par 3 17th hole requires some serious consideration. A really great back nine with lovely holes that test you across the entire bag. Fairway grass was long but this is understandable due to the heat. Recommended as a must play. Very quiet so not under any time pressure, which is good as it was very hot. Interesting course which is a good challenge for a mixed group of golfers. Good greens. Assoufid was our least favourite to play but only because the fairways had recently been holotined and we had to play clean and place the course was visually spectacular and really difficult if your not the longest driver of the ball. I would say if your a low handicapper this course will be a real challenge for you!! The practice facilities were great and at no extra cost!! The 19 hole was a nice place to be and like all the other courses the drinks were expensive at £30 for 4 beers!! Over all this is a really nice course it was just lacking a little condition and was a little to tough for our party but would definitely play it again if the fairways were back to there best.